Trees are located in the Southern California Region only, making them rare. Growth is in the form of low, angular limbs, with an open canopy. The trees are drought-deciduous, with tendencies to grow in deep, loamy soil. The seedling are fire tolerant and grow quite readily in partly shaded areas. 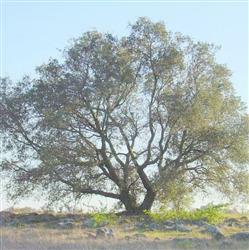 Some assume that, because this oak is native to Southern California, it will tolerate all of the climatic vagaries handed out by Mother Nature and be plastic enough to adjust; most authorities recommend that, when the annual precipitation is below normal (fifteen inches), supplemental deep and thorough monthly watering through spring is advisable. If summer temperatures are above normal (with extended periods of extreme heat), one or two supplemental applications of water are also advisable (in August and/or September). Apply the water several feet from the trunk, well into the drip zone and beyond; keeping the water away from the trunks helps avoid concentrated amounts of water soaking directly onto the main roots. Any pruning should be restricted to the month of September, when the trees are most dormant.